I am not the most generous when it comes to hair care if I am honest but I am happy to spend huge amounts on skincare! I have heard so much about the Bumble and Bumble brand over the last 12 months but I have never tried anything because I find the products expensive but if they work then it's definitely worth paying the price. I do prefer trying out items before buying and this was a brand I have wanted to try for a while. I think I will save these samples to use over the weekend...maybe on days out so I can really work the samples like the thickening spray. Have you tried this brand before...if you have which products would you recommend? I have linked the items below just click on the one you are interested in and it will give you all the product info. I spent ages wanting to try some Bumble & Bumble. I got a set of samples like yours, the thickening spray, straight cream and some hair chalk. I have to admit, I hate the thickening spray because it just made my hair rough and knotted but the straight cream is pretty good. I'm not sure its notably better than my other products though. Perhaps I picked the wrong items to start off with! I actually tried the thickening spray yesterday and it actually works very well for my hair texture. I didnt get the knots but the slight roughness certainly made it appear thicker with texture and much more easier to style for me. Maybe go to your nearest Bumble counter to ask for advice! Good Luck! I agree it is quite handful to try new products in advance, at least it helps to decide what products are really worth it. I normally feel reluctant to invest s big sum of money wothout some kind of previous test, and that's the reason why my cupboards are full of products my friends made me try. I am really looking forward to hear more about these. By the way, I am pretty curious about your header design: may I ask how did you get such an amazing colour and texture for the word 'lemon'? It is always nice to learn a bit more about design. Yes they are expensive so I definitely would not buy unless I have tried samples. There is so much talk about this brand recently and you should try for yourself. Pop to your local Bumble counter and see if they have samples. As for my header it was designed by At First Blink. Drop me a tweet if you contact details. Pop to your local counter and ask for samples to try! Let me know how you get on! I will do an updated post once I have tried them but I have read lots of great things about this brand from other bloggers. We are too similar Chie!!! 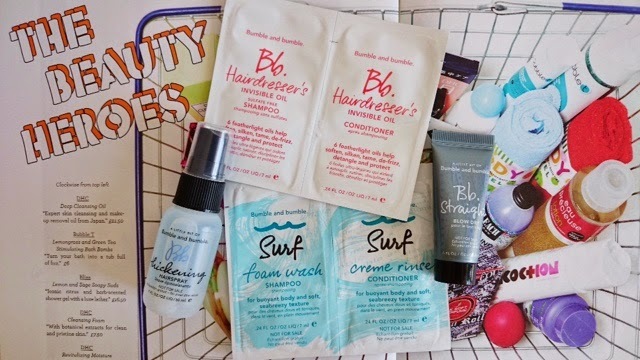 always wanted to try bumble and bumble products!! my hairdresser recommended the Shu Uemura restorative shampoo so will see how I get on! How are you getting on with Shu Uemura? I have heard their hair masks are really good, I have only ever brought their make up. Let me know if you do a review on your blog.